Catherine McCord shares the recipe for chocolate velvet beet cupcakes from her new Weelicious cookbook. Ever since Little M started eating solids, I have been spending a lot more time in the kitchen. I enjoy experimenting with new recipes and cooking up nutritious dishes for him. It is really important to me that he develop an appreciation for all kinds of different foods, spices and flavors. I frequently turn to Weelicious in my search for kid-friendly meals that the whole family will enjoy, it is a wonderful resource for anyone looking for healthy and delicious recipe ideas. 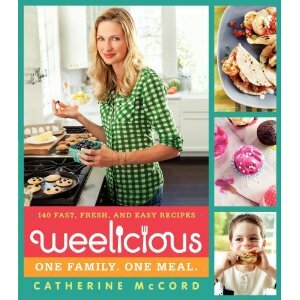 Catherine McCord, mom, chef, blogger and now author of the new Weelicious cookbook, certainly knows how it feels to spend a lot of time in the kitchen. She remembers how hard it was for her to find fresh, healthy recipe ideas when her son started eating solids. After having little luck finding resources online, she took matters into her own hands and created the Weelicious blog to share her experiences and tips with other parents. I love that Catherine believes in not only cooking for her kids, but also with them. She takes them along to their local farmers markets, gets them involved in the kitchen and enlists their help to taste test recipes. I managed to get my hands on a copy of the (gorgeous) cookbook and it is packed with useful information including lists of pantry staples, essential cooking gear and suggestions for giving kids more control over their food choices. Best of all, there are so many new recipes for us to try at home! You can find the Weelicious cookbook here; Little M and I are planning to make the blueberry-lemon whole wheat pancakes for breakfast this weekend! Catherine has shared one of her favorite recipes with Crayons and Croissants’ readers! Read on for a sneak peek from her new cookbook. Now and then, we love taking the kids by our favorite neighborhood cupcake store to enjoy a special treat. Of course their eyes are always drawn to the most colorful cupcakes in the display case. My kids may have no idea how they actually taste, but put something like a red velvet cupcake made with crimson food dye in front of them and their immediate response is, “That one.” These chocolate velvet cupcakes have a rich chocolate flavor, but they aren’t artificially red like cupcakes that use chemical food dyes. They and their icing get their bright reddish-pink color from a surprising, delicious, and 100% natural guest: roasted beets. You’d never know that though, since there’s no beet flavor in them. Just deep, rich chocolate! 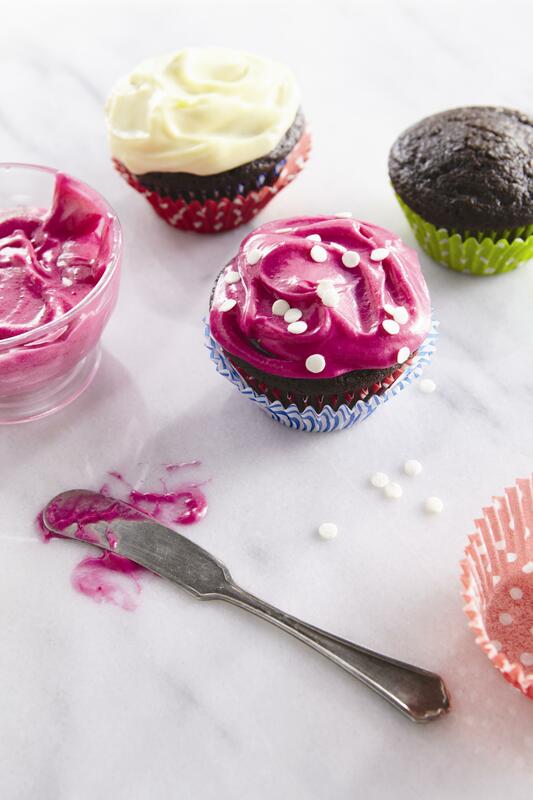 I offer two ingredient versions for the frosting here, one white and one a delightful beet-stained pink! 2. Sift the cocoa powder, flour, baking powder, baking soda, sugar, and salt into a large bowl. 3. In a separate bowl, whisk together the rest of the ingredients. 4. Slowly add the dry ingredients to the wet, stirring to combine thoroughly as you go. 5. Pour about 1/3 cup batter into paper-lined muffin cups and bake for 25 minutes, or until a toothpick comes out clean. 6. Cool thoroughly, frost, and serve. The cupcakes will keep in a covered container on the counter for 1 day, or in the fridge for up to 3 days, or you can freeze them for up to 3 months. To puree beets: Preheat the oven to 375˚F. Wrap the beets in foil and bake for 45 minutes, or until fork-tender. Remove the beets from the foil and set aside until cool to the touch. Put your hand in a zip-top bag (to avoid staining your hand) and rub the skins from the beets. Puree the beets until smooth. 1. Place all the ingredients in a mixer and beat on medium-high speed until fluffy. 2. Spread the frosting onto the cooled cupcakes.